The Sandhills covers portions of northern and western Nebraska. A view of the Dismal River, Sandhills, and U.S. Route 83 in Thomas County. Dunes in the Sandhills may exceed 330 ft (100 m) in height. The average elevation of the region gradually increases from about 1,800 ft (550 m) in the east to about 3,600 ft (1,100 m) in the west. 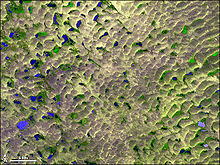 The Sandhills sit atop the massive Ogallala Aquifer; thus both temporary and permanent shallow lakes are common in low-lying valleys between the grass-stabilized dunes prevalent in the Sandhills. The eastern and central sections of the region are drained by tributaries of the Loup River and the Niobrara River, while the western section is largely composed of small interior drainage basins. The 1904 Kinkaid Act allowed homesteaders to claim 640 acres (260 ha; 2.6 km2) of land, rather than the 160 acres (65 ha; 0.65 km2) allowed by the 1862 Homestead Act. Nearly nine million acres (36,000 km2) were claimed by "Kinkaiders" between 1910 and 1917. Some of the Kinkaiders farmed the land, but these attempts generally failed. 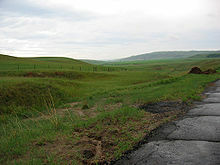 This included Nebraska's largest black settlement, DeWitty, which was located in southeast Cherry County until the 1930s. Many of the largest ranches broke up about the same time due to regulations against fencing federal range lands. The Sandhills is classified as a semi-arid region, with average annual rainfall varying from 23 inches (580 mm) in the east to less than 17 inches (430 mm) of rain in the west. Temperatures range from lows of −30 °F (−34 °C) to highs of 105 °F (41 °C). Valentine National Wildlife Refuge, located about 20 miles (32 km) south of Valentine, encompasses 71,516 acres (28,941 ha). Crescent Lake National Wildlife Refuge in the central Panhandle covers 45,849 acres (18,554 ha). 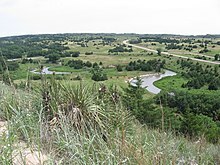 The Nature Conservancy's Niobrara Valley Preserve in Cherry, Brown, and Keya Paha counties covers 60,000 acres (202 km2) and includes a 25-mile (40 km) stretch of the river. Fort Niobrara National Wildlife Refuge near Valentine covers 19,000 acres (77 km2). Partnering in the effort to conserve the Sandhills are the Institute of Agriculture and Natural Resources, West Central Research and Extension Station, the Nature Conservancy of Nebraska, the Natural Resources Conservation Service, the Nebraska Natural Heritage Program, the University of Nebraska, and the United States Fish and Wildlife Service. ^ "Nebraska Sand Hills". National Natural Landmarks. National Park Service. ^ a b "Sand Hills Program". Partners for Fish & Wildlife — Nebraska. U.S. Fish and Wildlife Service. Retrieved September 4, 2018. ^ a b "Nebraska Sand Hills mixed grasslands (NA0809)". Terrestrial Ecoregions. World Wildlife Fund. Retrieved July 21, 2007. ^ Folland, C.K. ; Karl, T.R. ; Christy, J.R.; Clarke, R.A.; Gruza, G.V. ; Jouzel, J.; Mann, M.E. ; Oerlemans, J.; Salinger, M.J. (2001). "2.3.3 Was there a "Little Ice Age" and a "Medieval Warm Period"?". In Houghton, J.T. ; Ding, Y.; Griggs, D.J. ; Noguer, M.; van der Linden; Dai; Maskell; Johnson (eds.). Working Group I: The Scientific Basis. Intergovernmental Panel on Climate Change Climate Change 2001. Cambridge, United Kingdom and New York, NY, USA: Cambridge University Press. p. 881. ISBN 978-0-521-80767-8. Archived from the original on April 9, 2010. ^ Hughes, Malcolm K.; Diaz, Henry F. (1994). "Was there a 'medieval warm period', and if so, where and when?". Climatic Change. 26 (2–3): 109–142. CiteSeerX 10.1.1.464.7516. doi: 10.1007/BF01092410. ^ Mangan, Jennifer M.; Overpeck, Jonathan T.; Robert S., Webb; Wessman, Carol; Goetz, Alexander FH (2004). "Response of Nebraska Sand Hills natural vegetation to drought, fire, grazing, and plant functional type shifts as simulated by the CENTURY model". Climatic Change. 63 (1–2): 49–90. doi: 10.1023/B:CLIM.0000018516.53419.90. ^ Lynas, Mark (2008). Six Degrees: Our Future on a Hotter Planet. National Geographic. p. 336. ISBN 978-1-4262-0385-5. ^ UCAR (October 19, 2010). "Climate change: Drought may threaten much of globe within decades" (Press release). University Corporation for Atmospheric Research. Archived from the original on January 14, 2012. Retrieved September 4, 2018. ^ Nebraska State Historical Society (June 29, 1998). "U.S. Government Land Laws in Nebraska, 1854-1904". Official Nebraska Government Website. Retrieved July 21, 2007. ^ "National Collection of Endangered Plants". US Center for Plant Conservation. Archived from the original on October 23, 2008. Retrieved May 3, 2008. ^ "About the Refuge". Valentine National Wildlife Refuge. Retrieved May 2, 2017. ^ "Crescent Lake National Wildlife Refuge". Retrieved May 2, 2017. ^ "Media Notes on Keystone XL Pipeline Project Review Process: Decision to Seek Additional Information" (Press release). Washington, DC: U.S. State Department. November 10, 2011. Archived from the original on November 11, 2011. Retrieved March 22, 2012. ^ Department of State Record of Decision and National Interest Determination — TransCanada Keystone Pipeline, L.P. Application for Presidential Permit (PDF) (Report). Washington, DC: U.S. State Department. November 3, 2015. pp. 2–3. Retrieved September 4, 2018. Bleed, Ann (1990). An Atlas of the Sand Hills. New York: Conservation and Survey Division, University of Nebraska at Lincoln. ISBN 978-1-56161-002-0. Jones, Stephen (2000). The Last Prairie. Camden Maine: Ragged Mountain Press McGraw Hill. ISBN 978-0-07-135347-2. World Wildlife Fund, ed. (2001). "Nebraska Sand Hills mixed grasslands (NA0809)". WildWorld Ecoregion Profile. National Geographic Society. Archived from the original on March 8, 2010.